Partitioning your hard drive sounds like a technically involved task that most people don’t need to bother with – but it’s actually relatively simple to do, doesn’t have to cost you any money, and can make your computing life easier and more productive. Here are the advantages of a partitioned hard drive, and why you might want to do it. Partitioning splits your hard drive into multiple drives: You don’t actually take a saw to your internal disk, but you do split it up into chunks at the lowest level of the operating system. The end result is that as far as Windows or macOS is concerned, you’ve got two drives installed rather than one. If you’re using a desktop computer you can, of course, physically install a second hard drive instead. It’s a tidier option than partitioning, though it means opening up your computer case and spending more on an additional drive. As long as you’ve got the storage space to spare, partitioning makes the most sense for most people. Partitioning is usually done with a specific purpose in mind, rather than on a whim. One of those purposes that we’ve written about before is dual-booting operating systems – with two partitions available, you can, for example, run macOS on one of them and Windows on another (Apple has an official tool for this, as we’ll explain). As long as both partitions are visible to your computer as it boots up, you can choose which OS you want to make use of. All of your applications and files are typically kept separate from one another, though in some situations you can set up a dual-boot system so that files on one drive can be seen and accessed from the other. Even if you’ve got no interest in setting up a dual-boot configuration on your computer, you can still benefit from a separate partition for your key files and folders – all those photos, videos, documents, music, and other crucial files that you rely on day to day. Why have them on a separate partition? Quite simply because it isolates them from whatever operating system you’re running – you can reset and refresh Windows without worrying what’s happening to your data, or even switch to a different operating system altogether without affecting the files stored on the data partition. It also makes data recovery easier if your OS partition is damaged or corrupted in some way. In fact many computers now come with an emergency partition all set up instead of the old recovery disc that used to be supplied – if you can’t boot up your laptop or desktop normally, you can boot from this recovery partition instead and get back your data. Having a separate data partition also makes sense from a backup or encryption point of view: You can focus on this one particular drive without having OS files and applications get in the way. It’s easier to point a backup program to a whole (partitioned) drive than picking out files and folders individually. Both macOS and Windows have built-in partitioning tools that do the basics, and third-party alternatives are available for both OSes if you need something that’s more advanced or professional. In the case of macOS, the tool you want is Disk Utility (find it in Applications or search for it in Spotlight). You’ll see your main internal drive appear, then your options are to either click the Partition button or the Plus button above the Volume label. Modern-day Macs make use of a new file storage system called APFS (Apple File System), and it has its own alternative to partitions in the form of volumes (the two terms are sometimes used interchangeably, which can get confusing). You still get the choice of either creating a new partition or a new volume in Disk Utility, but Apple is pushing users towards volumes as the faster and simpler option. A lot of the differences are behind the scenes: Volumes can change size dynamically, for instance, while partitions have a fixed size. For most purposes you can go ahead and use a volume, though partitions are still useful for maintaining compatibility with non-APFS systems (if you want to install Windows, for instance). Creating a volume or partition only takes a couple of clicks in Disk Utility. You’ll need to name the new disk space, and specify its size if it’s a partition (you can set a minimum and maximum size for a volume too, but it’s easier just to let macOS manage everything itself). 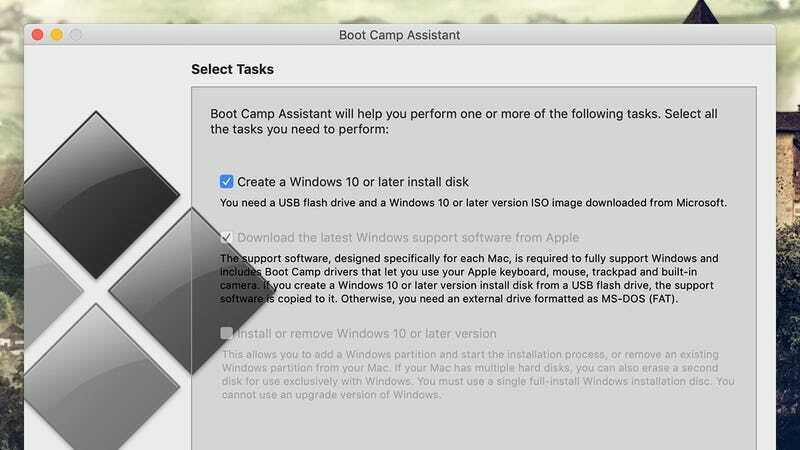 If you want to create a partition specifically to install Windows alongside macOS, use Apple’s Boot Camp utility – launched from Utilities inside Applications, or the Spotlight search. 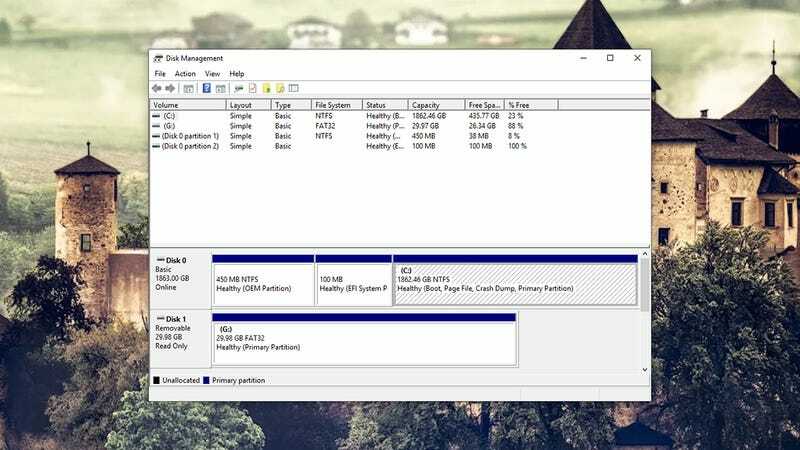 The setup wizard takes you through the process of creating a new partition and installing Windows on it. 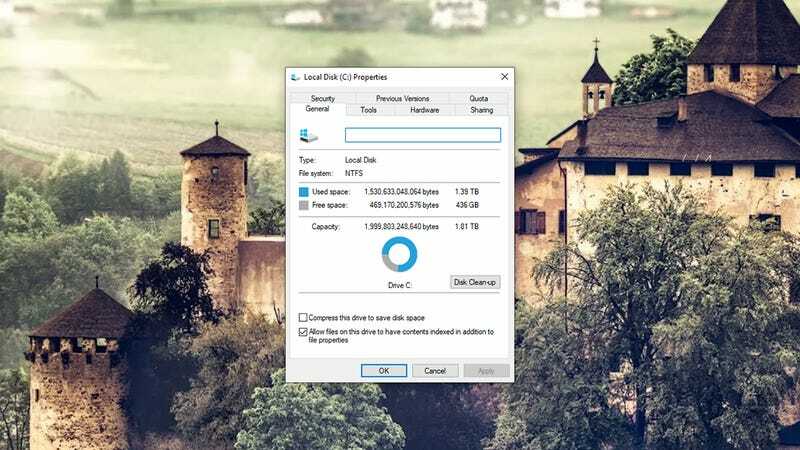 Over on Windows systems, the built-in tool you need is Disk Management – just search for it from the search box on the taskbar (it may well appear as Create and format hard disk partitions, which gives away its primary purpose). This integrated Windows tool isn’t quite as slick or intuitive as its macOS counterpart. 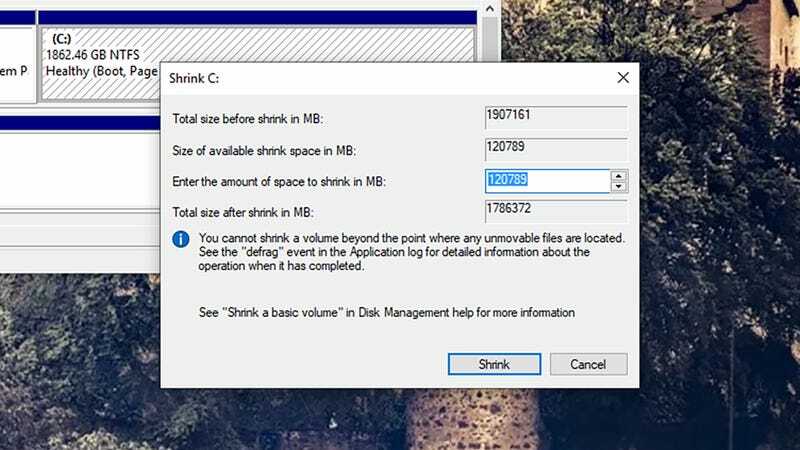 First you need to reduce the size of your existing hard drive partition by whatever size you want the new partition to be: Right-click on it and choose Shrink Volume to do this. Once some space has been cleared, you can right-click on that and pick New Simple Volume to get the new partition formatted and ready to access. If you’re installing a different operating system on the newly created partition, you can usually skip that last step: The OS installer will do the job for you and get everything set up so the partition is accessible. When it comes to choosing how much space to leave for your new partition, it’s not an exact science. Obviously it depends on how much room you have available in total, and what you want to do with your newly partitioned space: A whole separate operating system is going to take up more room than a few documents. 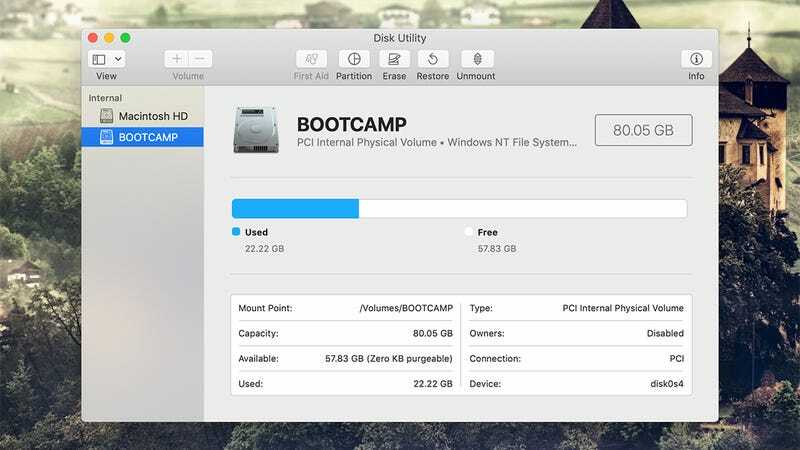 In the case of Apple’s Boot Camp, 64GB is the minimum you need to run a copy of Windows alongside macOS, and 128GB is recommended for the best experience (you wouldn’t really want to buy a Windows PC with 64GB of storage). You can use that as a guide to how big your new partitions should be. Third-party partitioning programs offer a few advanced features on top of that, like easier partition management, partition merging and resizing, and built-in data recovery tools. They can be worth the outlay, if you’re going to be doing a lot of partitioning and need something more user-friendly. EaseUS Partition Manager is one of the best options for Windows: There’s a free edition that’s easier to use than Windows’ own Disk Management, and the Pro version (with cloning, converting, migrating and other advanced features) will set you back $40 (around £30), but a free trial is available. 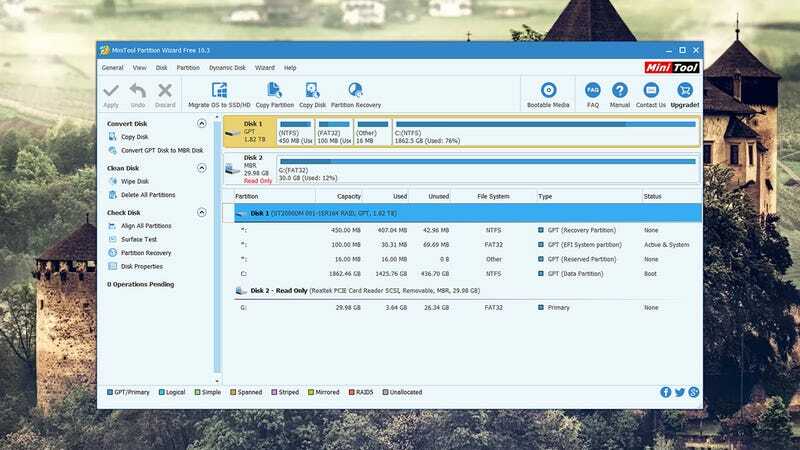 Also high up on our list is MiniTool Partition Wizard – as with the EaseUS application, you’ve got a basic free edition and a more advanced Pro version (£30 with a free trial). It’s got perhaps the friendliest interface of all the programs we’ve mentioned here, and includes just about everything you’ll need. Paragon Hard Disk Manager is a good bet for Mac and Windows and also costs £31 (and also offers a free trial). 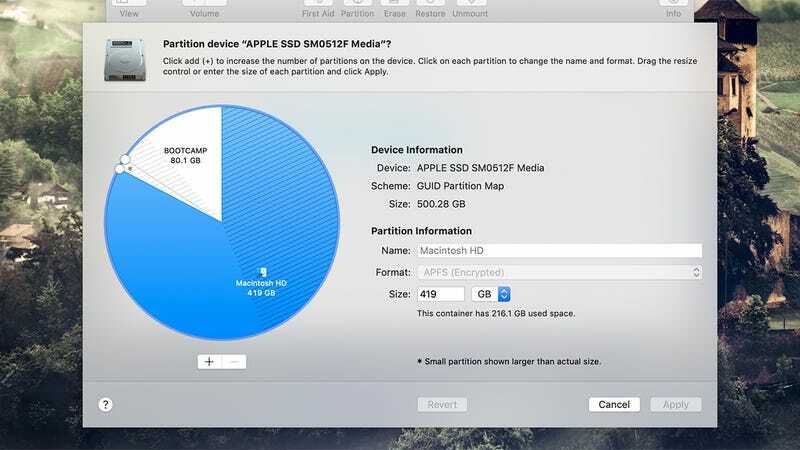 While the macOS Disk Utility and the Windows Disk Management tool will do the job well enough, Paragon Hard Disk Manager throws in extras like partition recovery, easy disk copying, and easier partition resizing. Also worth a look is Stellar Partition Manager, again $40 (around £30) for macOS, again with a free trial available – it can work with Boot Camp partitions too, if you’ve created them with Apple’s official tool. It offers a very similar feature set to the Paragon software for macOS, so you might want to check for specific functionality if you know you’re going to be needing it.